Not long ago, electric forklifts were only a minor segment of the total U.S. forklift market. However, as companies look to enact more environmentally friendly policies, electric forklifts are suddenly a viable option. Sales figures expect to rise in the next five years, and warehouse managers, dockyard supervisors, and others are considering the switch to electric powered lifts. If your company is considering converting your fleet from gas-powered lifts to electric forklifts, you’re not alone. While existing gas forklifts aren’t going away anytime soon, current market trends suggest that electric forklifts will continue to command an ever-larger percentage of the total U.S. forklift industry. The advantages of electric forklift trucks – which we’ll discuss in a minute – have created a strong demand for these environmentally friendly lifts, even as legacy forklifts still maintain a larger market segment. Traditional diesel & propane forklifts still command a considerable portion of total U.S. forklifts in operation, but new models like the Jungheinrigh 540k-S50 Series electric forklift offer impressive features and lower overall operating costs. From a safety standpoint, the U.S. Occupational Health & Safety Administration (OSHA) considers electric forklifts and gas-powered forklifts as similar. One of the benefits of electric forklifts is the absence of a fuel tank, which lessens the chance of fires and explosions. But despite this safety advantage, OSHA standard 1910.178 establishes safety requirements for all electric forklifts and electric powered industrial trucks. Electric forklifts have certain battery changing standards and other power-related considerations to account for – especially as part of your forklift maintenance plan – which are easy to follow and account for if you and your forklift drivers have the latest OSHA-compliant training from Certifyme.net. OSHA has upgraded their forklift safety standards with content specifically developed to account for electric forklifts. Just one example is their Electric Forklift Battery standard, recently established to account for the soaring popularity of electric forklifts. Maintenance aside, the advantages of electric forklift trucks are evident to foremen, shop supervisors, construction site managers, dockyard and warehouse personnel, and more. Why are electric forklifts becoming so popular? One reason is the environmentally–friendly operation. With many companies looking to reduce pollution, electric forklifts are obvious tools to help meet certain “green” initiatives. But that’s only one reason why so many companies are purchasing electric forklifts. What are some advantages of electric forklift trucks? Performance: Electric forklifts are undervalued as everyday assets. Proponents of propane forklifts tout the traditional lifts, but let’s dig deeper. Electric lifts have better braking technology, a tighter turning radius and, thanks to enhanced tire technology, better-than-expected control characteristics. Cost: A typical internal combustion engine (ICE) forklift is about 3-5 times more expensive to operate than its electric counterpart. And with fewer tune-ups, a reduction in engine parts and no tank refills, electric forklifts are also more productive than legacy forklfits. Reduced Pollution: With virtually no fuel expenditure, electric forklift fit modern “earth-friendly” initiatives. With manufacturing trending green, electric forklifts are a smart, cost-efficient option. Plus, workers are not exposed to harmful tailpipe emissions with electric forklifts. The bottom line: less carbon footprint, more healthy work environment. Batteries: Much like electric-powered automobiles, the batteries for electric forklifts are designed for long-lasting performance. Over the lifetime of a typical electric forklift battery, a powered industrial truck will save hundreds of gallons of gasoline. Sure, batteries will eventually wear out. But with battery technology always advancing, electric forklifts will use less physical batteries, which will reduce landfill and bypass all the typical gas and combustion engine considerations that come with regular lifts. For more information about electric forklift batteries and safety standards, please see the OSHA Battery Charging and Changing Procedures. Battery life is one of the biggest advantages of electric forklift trucks but that’s not the only one! Energy security: Energy efficiency and security is perhaps the most underrates of all the advantages of electric forklift trucks. The U.S. still imports millions of gallons of oil on a daily basis. Slowly and surely, electric forklifts (along with electric cars) are helping reduce the need for the U.S. to rely so much on foreign imports. As gasoline forklifts become less prevalent in the construction, distribution, and warehousing sectors, electric forklifts are helping to fill the void with reliable, safe, and efficient transportation – all with a better overall economic benefit. If you need forklift training (either electric or standard ICE powered), Certifyme.net offers a complete, OSHA-compliant course for your specific requirements. With proper training, your forklift operators will avoid common mistakes that cause serious injuries. Plus, your company will avoid hefty fines and penalties from a surprise OSHA visit to your facility. It doesn’t matter if your forklift fleet consists of gas-powered or electric forklifts – OSHA can still audit your operation any time they see fit. With the benefits of electric forklifts becoming clearer every day, it makes sense to implement an OSHA-compliant safety plan. Fortunately, Certifyme.net has a great selection of forklift safety courses (for both gas and electric powered lifts) that meet and exceed the latest OSHA safety standards. With Certifyme.net, you’ll enjoy OSHA expertise, exceptional customer support and even free lifetime electric forklift training renewals! 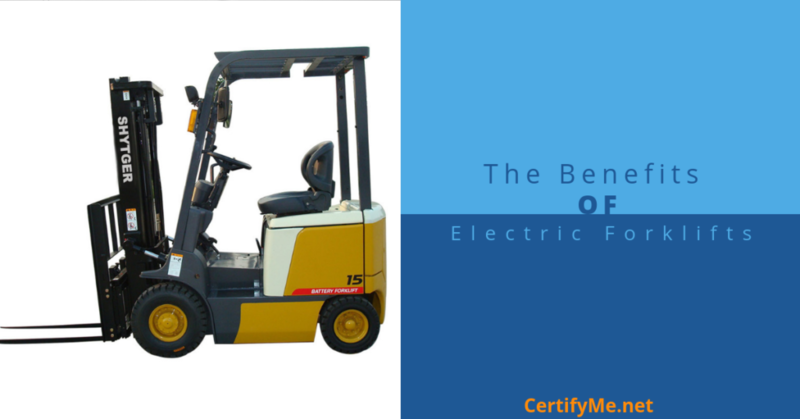 Now you know about the advantages of electric forklift trucks. Now, enjoy additional benefits with OSHA compliant forklift training with CertifyMe.net. Contact us today to learn more about our forklift instruction programs. You can send us a secure message at our contact page or call us at (888) 699-4800. If your workforce isn’t properly trained, now is a great time to see what CertifyMe.net can do for you!